Good morning all my awesome friends and followers...today is a bit of a bittersweet day as I will be sharing with you my final projects for Scrap FX. When this amazing company took me on 9 months ago, I cannot relay to you the excitement I felt! And it has been SUCH an honor to design with their amazing products all this time. Jill Wheeler (the owner) has been spectacular since day one and anyone who is lucky enough to design for her can expect to be treated with true professionalism. Michelle Logan, the design team coordinator, keeps the team and the blog running like clockwork. And my teammates have been one of the most laid-back, drama-free bunches I've ever had the privilege of working with. So making the decision to step down from my spot on this team was not an easy one to make. But as I've discovered in this industry, hard decisions are sometimes required of us, and an opportunity was offered to me by another company that I simply could not turn down. So here we are :). I'm happy to report, however, that for you fellow Scrap FX fans out there that as we inch closer to March, you can expect a Scrap FX Design Team Call~! During my time with Scrap FX, I've received so many emails in regards to not only WHERE this amazing product can be found, but WHEN Scrap FX will be having a DT call so they too could play as I've been able! So keep an eye out- because it's coming :)!! Of COURSE we need a closer look, right?! You’ve got to love a great title! 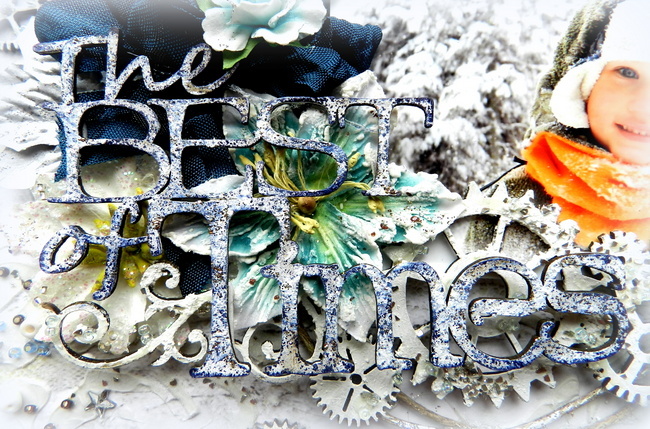 Playing outside in the snow certainly is “The Best of Times“, just as this Scrap FX title says! Funny, when it’s summertime and hot and sunny out- I sometimes have to kick this little guy out there! But come wintertime- day or night, he loves to go. I suppose it’s because there aren’t any bugs in the winter, lol! For my title, I first primed with gesso, then lightly dabbed with a dark blue ink, dabbed again with gesso, tapped the edges with the same blue ink for a little definition, and finally finished the piece off with some silver Stickles. Another amazing flourish piece! 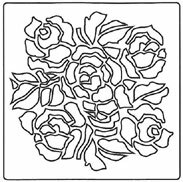 The “Steampunk Flourish Border” is just awesome. I covered it first with gesso before dabbing randomly with some texture paste. 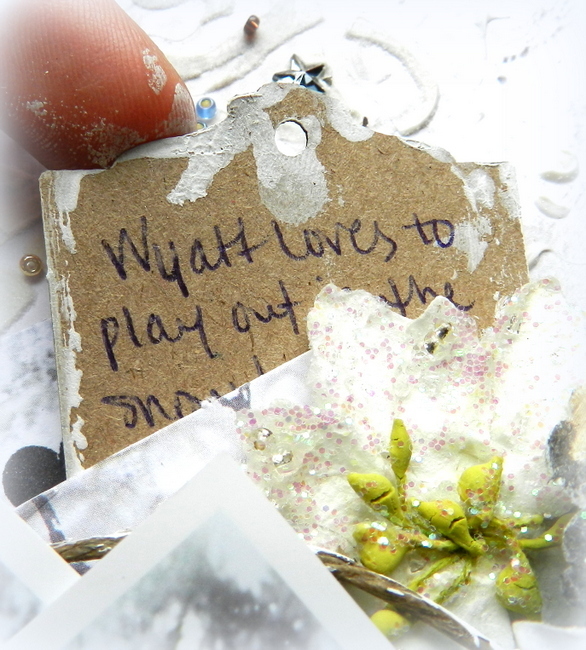 While the texture paste was still wet, I added some silver broken glass glitter and some seed beads to give it a “frosty” feel. I just cannot get enough of these “Cogs, micro” pieces! I’ve treated them in a similar fashion to the flourish, except I used only gesso and then some glossy accents to hold the beads in place. I’ve also dabbed randomly with some silver Stickles. 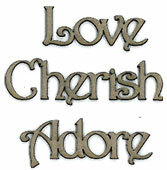 Scrap FX has yet again struck gold with their stencils! Here I’ve used the “Rose Stencil“, along with some modeling paste, embossing powder, and plenty of confetti goodies to create plenty of interest! What I love most about these stencils is how DURABLE they are! I tend to use my masks/stencils a lot and washing them can really cause some damage over time. But the Scrap FX stencils are of a thicker material and they really hold up! Love that! Finally, I’ve included some hidden journaling on a tag from the “Flourish Tag Set, Kraft” pack. I stuck with the same “elegant grungy” look I was going for with my layout on my card . 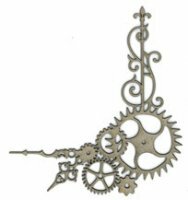 The “Steampunk Corner B- Clock Hands” piece was the perfect size for the cluster on my card. 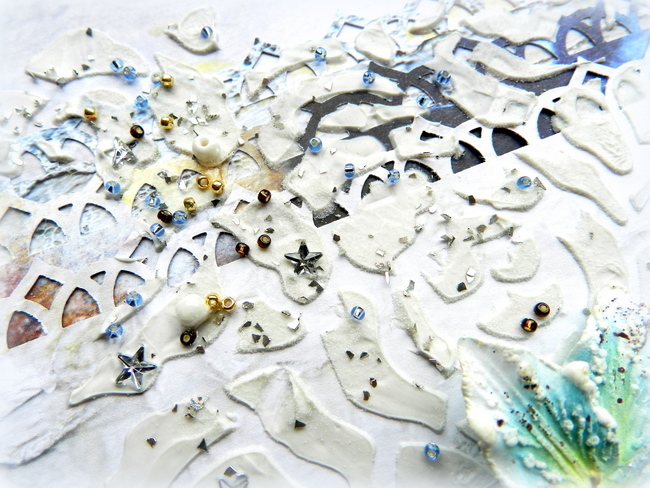 I randomly applied gesso before adding some seed beads (again, sticking with the same idea on my layout). For my title, I layered the “Love” piece from the “Love- love/cherish/adore” pack over the “Steampunk Man” gear piece (man removed, lol). My title was primed with gesso and then stamped, while the gear piece was treated in the same fashion as the Steampunk Corner. I just wanted to end my post by saying a big "THANKS!" to Scrap FX for EVERYTHING. For offering a quality product and for being a company I've always been proud to represent. It's truly been a pleasant experience and I know that they will continue to grow by leaps and bounds- and I'm honored to have been a member of their first-ever design team :). Wow! That is so cool!!! Love the colors and all the layers! Everything you create is amazing Erin! Love the colors!!! You always make the most beautiful projects such as those you share today. Love how you used the Scrap FX chipboard. I love snow; so anything to do with that attracts my attention! lol And that card is spectacular! Wow! This ia amazing!!! You will be missed there for sure! Beautiful projects! Have a wonderful 2013! Beautiful use of all of the chipboard pieces Erin!! And the texture on your page is amazing! Both your lay-out and your card are truly gorgeous! I love that you went a little masculine on them both, you used the gears in such a wonderful way!